Ever since I have been working for Neo, we have been trying to give our audience as many powerful examples of places where graph databases could really shine. And one of the obvious places has always been: social networks. That’s why I’ve written a post about facebook, and why many other graphistas have been looking at facebook and others to explain what could be done. But while Facebook is probably the best-known social network, the one I use professionally the most is: LinkedIn. Some call it the creepiest network, but the fact of the matter is that professional network is, and has always been, a very useful way to get and stay in contact with other people from other organisations. And guess what: they do some fantastic stuff with their own, custom-developed graphs. 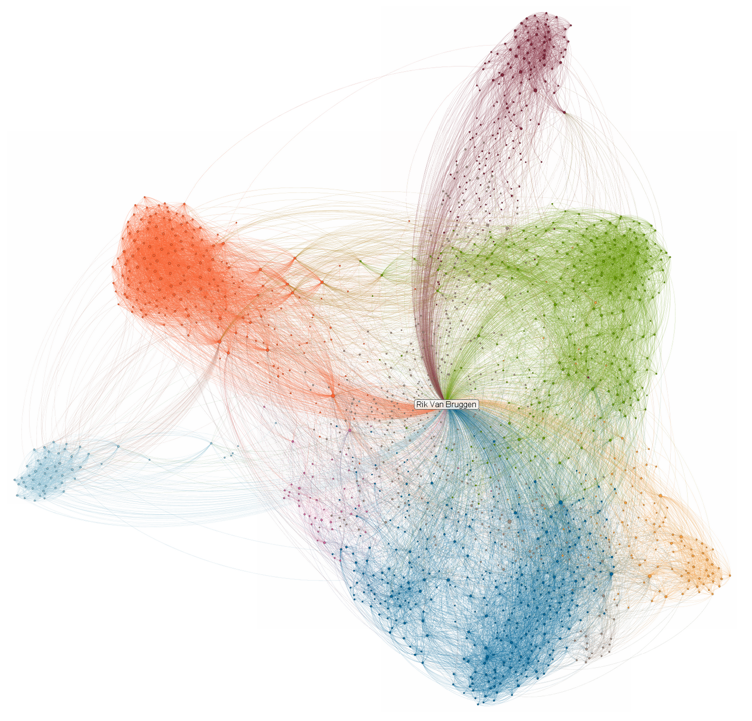 One of these things is InMaps - a fantastic visualisation and colour coded analysis of your professional network. That’s where this blogpost got its inspiration from. The thing is: the InMap above is a “static” picture of your network. You can’t really *do* anything with it. You can’t browse through it. You can’t query it. 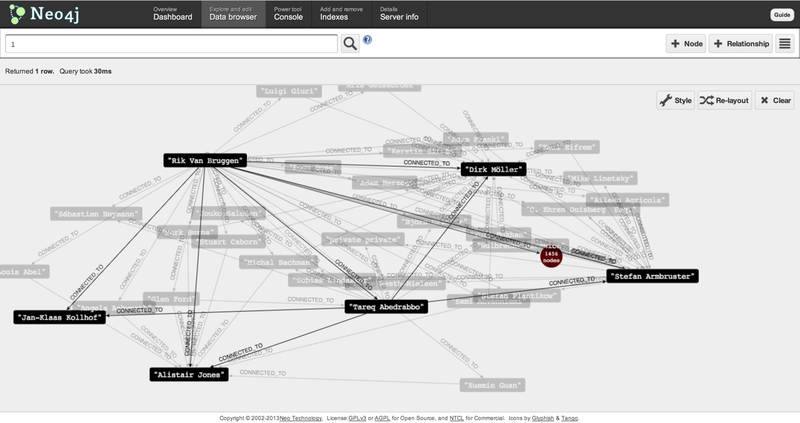 So there began my quest for a way to get the data out of the InMap, and into Neo4j. Something that I expected to take days or weeks - but from the first google search to publishing this post was literally just 2-3 hours of work. It’s dead easy. Well I should qualify that. You of course have to have somepleace to start - a place that can help you get the data from LinkedIn, into a format that I could work with to import into neo4j. So after 5 minutes of googling, I came across this Dataiku blog post by Thomas Cabrol that had written a couple of simple python scripts to get me going. Thomas’ scripts run against the LinkedIn developer API. This API requires you to authenticate, and therefore you actually need to register an application (in this case: the python scripts) in your configuration. Easy to do: just go to LinkedIn's developer site and just register an app. Thomas’ work was based on 3 scripts (one to get the OAuth credentials, one to extract the data from LinkedIn, and one to clean up some duplicates), but for the purpose of this blog post (and because of some changes in LinkedIn’s OAuth policies) you really only need 1 script. I have therefore had to fork Thomas’ script and have put my version over here. Note that you will need to insert your own credentials and name for this script to make sense. ProTip: make sure that you have installed oauth2 and urlparse, the imported modules - otherwise the python script won’t work. 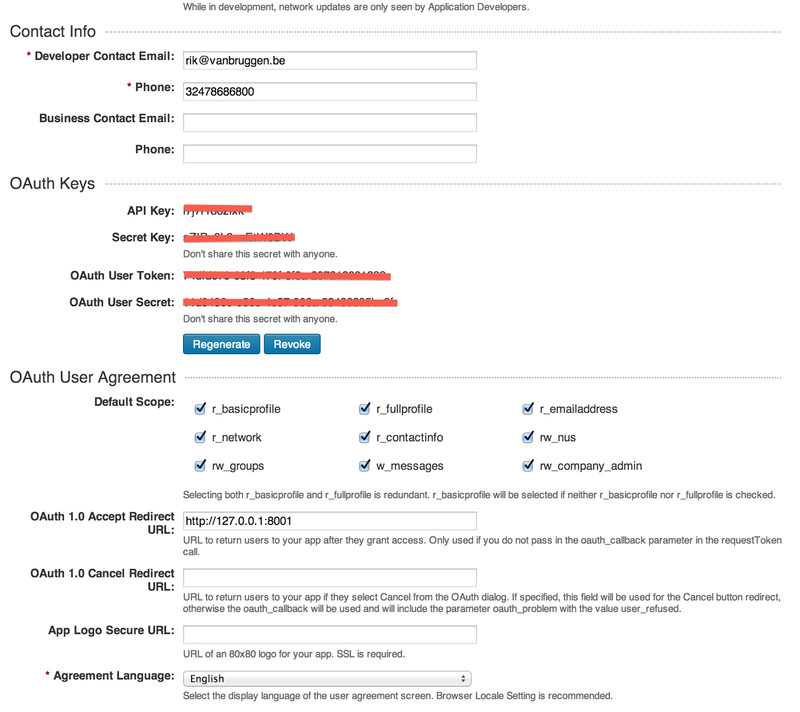 Important note: LinkedIn actually limits the amount of API calls that you can make to their servers. You can read more about it on their developer pages. For my network, it meant that I could only run the python script once per day. So beware! Start the Neo4j server. 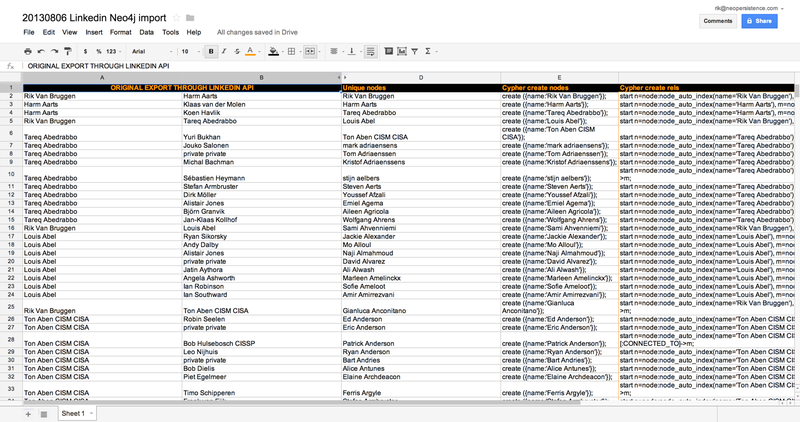 Take the spreadsheet, copy/paste the cypher queries into the console that connected to the server (bin/neo4j-shell) and you are all set. If you want to skip all that you could also just download the imported neo4j graph database and take a look at my professional network - but to be honest it’s a lot more fun if you do it with your own network. 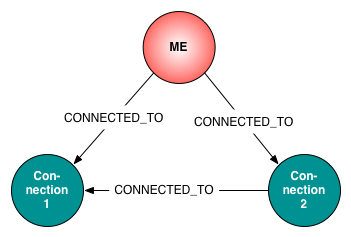 The nice thing of having this dataset into Neo4j now, is of course that we can interact with it. I personally found it very nice and cool - as is almost always the case with graphs - to “take a walk on the data”. Just grab a node in the webadmin, select some of its connections, and just interactively browse from node to node - and find out stuff about your LinkedIn network that you may not have known before. And then of course, you can also “programmatically” interact with the data - and Cypher is the prime tool for that. Here’s a couple of queries that I made up - but I am sure that you can make up some more. If you're into it, you can also put your own interactive visualization in front of the Neo4j graph database, something like Max de Marzi's Neovigator would be interesting.